The Vikings are at the heart of my interest in the Dark Ages and wargaming. After years of reading and study, I continue to find new facets to the Viking story. One area often overshadowed in comparison to the stories of Western Europe is the Eastern Baltic. The Baltic Finns, Estonians and Karelians are a related group of peoples speaking a Uralic language, somewhat related to Hungarian. In the Viking Age, their cold and marshy lands marked the first leg of the journey eastward to the Dnieper . Viking goods and burial sites begin showing up in the Lake Ladoga region in the ninth century. This might indicate a pattern of Viking settlement in the region, as they set up semi-permanent bases on the road to Constantinople. The artifacts might also indicate that the Finns and Karelians traded with the Vikings and also adopted some aspects of their culture. A significant Finnish element to the Viking Age might be the naming of the Rus. The Finn word for Swede, Ruotsi, may have stuck to the Eastern Vikings as they blended into the people later called the Rus. There is not a great deal written about the interaction between the Finns and the early Vikings, and even less is available in English. The story of the Vikings in the west is shaped largely by its raids on targets containing literate monks and by the later Icelandic Sagas. There is no comparable preservation of early Viking encounters in Finland and the Baltic. It can be surmised that the Finns were a frequent target for slave raids, but this decreased in frequency as the Vikings traded and mixed with the Baltic peoples. This early twentieth century Russian painting served as my primary visual inspiration for painting up some Viking Age Finns. Pinterest is also a good source of recreations of Finnish folk clothing from the Viking era, although much of the work is focused on female dress. 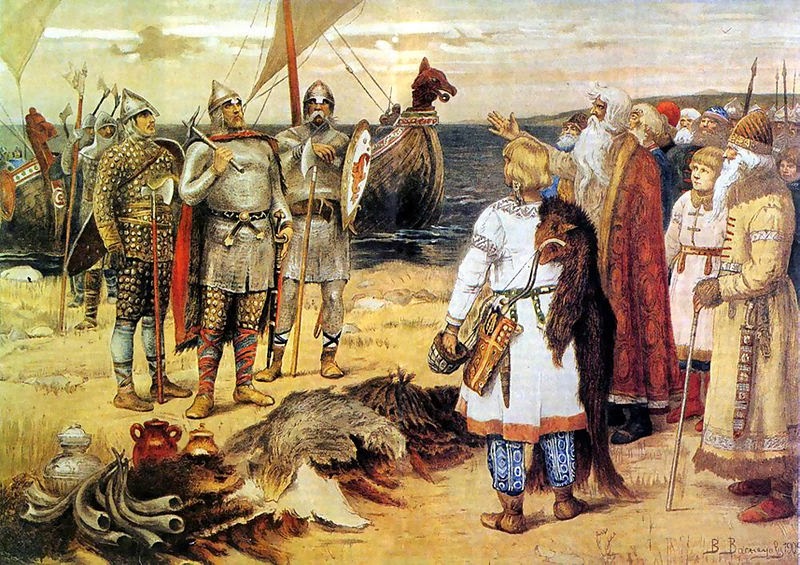 The Invitation of the Varangians, by Viktor Vasnetsov, 1909. 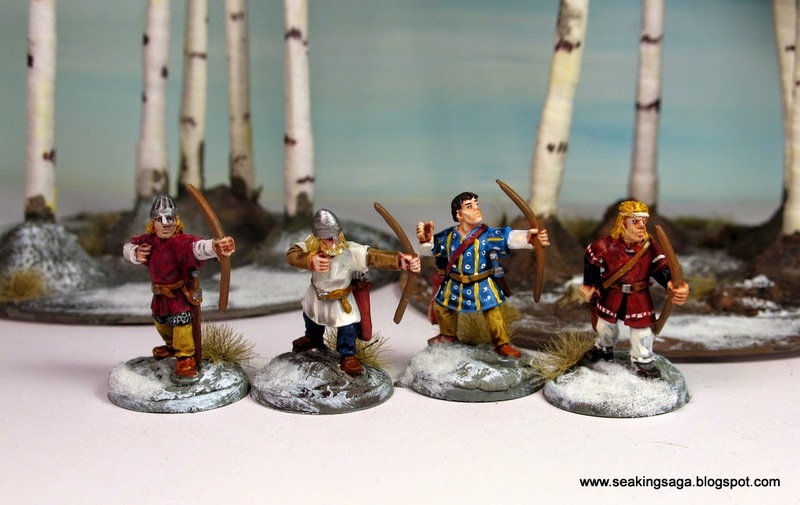 These Crusader Bondi archers are unarmored and some are beardless which fits in well with some of the presentations of Baltic Finns and Karelians. In the photo below, the figures on the far right were given a fur hat and cloak using a bit of green stuff. 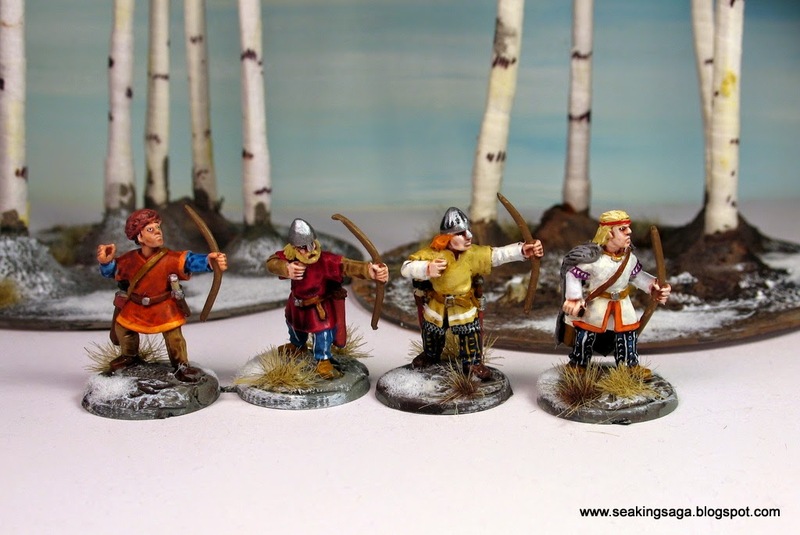 While a full faction of Finns is not really something I plan to pursue, I can see them fitting into a Rus warband in SAGA. However, as I dig into Open Combat, I find that it is a great system to do small custom warbands as I explore some of the more obscure recesses of the early Medieval period. This small band will make a raid on Viking settlement in an upcoming game, after I finish some longhouses - the subject of my next update. "The Baltic Finns, Estonians and Karelians are a related group of peoples speaking a Uralic language, somewhat related to Hungarian"
Now that is interesting indeed. You have sparked my interest! Your figures are gorgeous, as always, top notch conversions and paint job. Nice paint jobs and love the birch trees in the background. Makes me think like I live up north... wait I do live up north!